Except for maybe the North Pole itself, there’s no place brimming with more Christmas cheer than Grapevine, the Christmas Capital of Texas®. With more than 1,400 fun family events, the town should be at the top of the list for anyone looking to make lasting holiday memories. Speaking of Santa’s chilly home, Grapevine is home to the famous Grapevine Vintage Railroad, or as it is known come Christmas-time, the North Pole Express®. 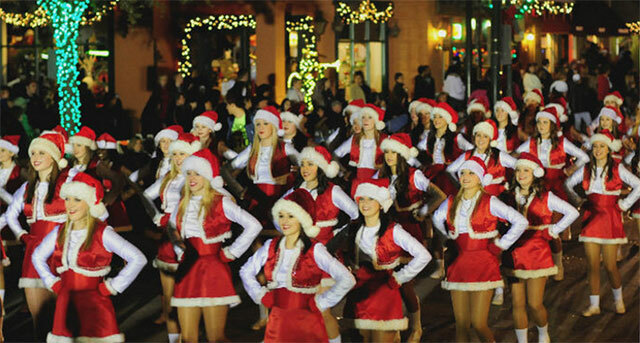 One of the most popular annual events in Grapevine, the train ride entertains passengers with caroling elves, Santa’s special Frosty Chocolate Snow Milk served in a keepsake mug, an appearance by Mrs. Claus, followed by a stroll through the snowy North Pole Forest and a Broadway-style show. If you’re interested in something a little more “grown up” than chocolate milk, hop on board one of the Christmas Wine Trains. These special event train rides feature reds and whites from the award-winning Texas wine paired with a catered meal. Of course, what would Christmas be without lights? Historic Downtown Grapevine is illuminated by thousands of colorful lights in the Carol of Lights ceremony, which happens before Thanksgiving. Festivities include the official lighting of Main Street, live music, fireworks, food and photo ops with live reindeer. The famous Grapevine Parade of Lights is one of the largest lighted Christmas parade in North Texas, while the Twinkle Light Boat Parade is certainly one of the quirkiest. The former boasts over 100 floats and marching bands jazzing up Main Street, while the latter involves decorated watercrafts floating along the shores of Lake Grapevine. Two local establishments in Grapevine also make for great places to make merry. Head to Gaylord Texan Resort, located on the north side of town near Lake Grapevine, to celebrate a Lone Star Christmas and ICE! ®. In true Texas style, the resort does Christmas big, with 1.5 million lights, 12,000 ornaments, a 54-foot tree, an eight-foot gingerbread house, and two million pounds of ice. All that frozen stuff provides the material for ICE! 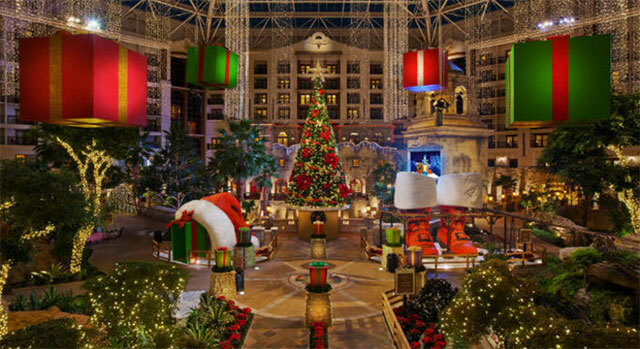 ®, Gaylord Texan’s magical world of Christmas-themed ice sculptures and ice slides. There’s also a12-lane snow hill where kids of all ages go rocketing down with tubes all season long. Grapevine’s beloved Palace Theatre is the other local highlight of the Christmas Capital. From concerts by the nationally-recognized Texas Tenors and Grapevine Opry Christmas shows, to screenings of classic Christmas movies, the theater has something for every holiday reveler. What better place to enjoy a Christmas show than a restored art-deco theater that looks like it’s straight out of It’s a Wonderful Life? So forget about long winter naps and head to Grapevine for all the magical moments you’ll experience in the Christmas Capital of Texas!